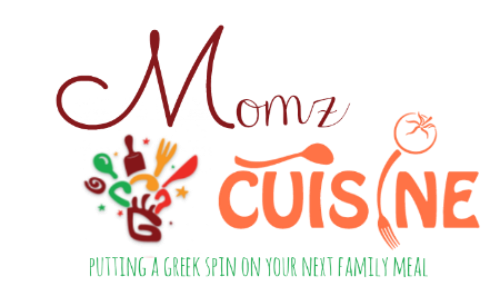 In 1999 during my honeymoon in Cyprus, I discovered a whole new culture of food that left my taste buds screaming for more. 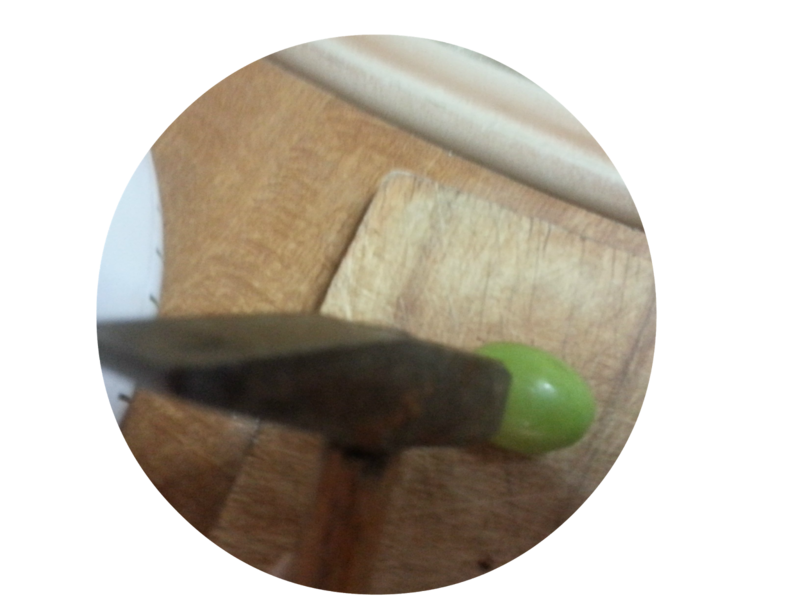 At a local Cypriot restaurant, while waiting to give our order, we were served cracked Cypriot green olives, as soon as I tasted them, it was a keeper in my marble recipe notebook. This is a Cypriot specialty that is very well known world wide. The original recipe calls for you to find a smooth stone and a nice spot under the shade but since I live in a city, this wasn't doable ;) Instead, I compromised with utensils that that I have. 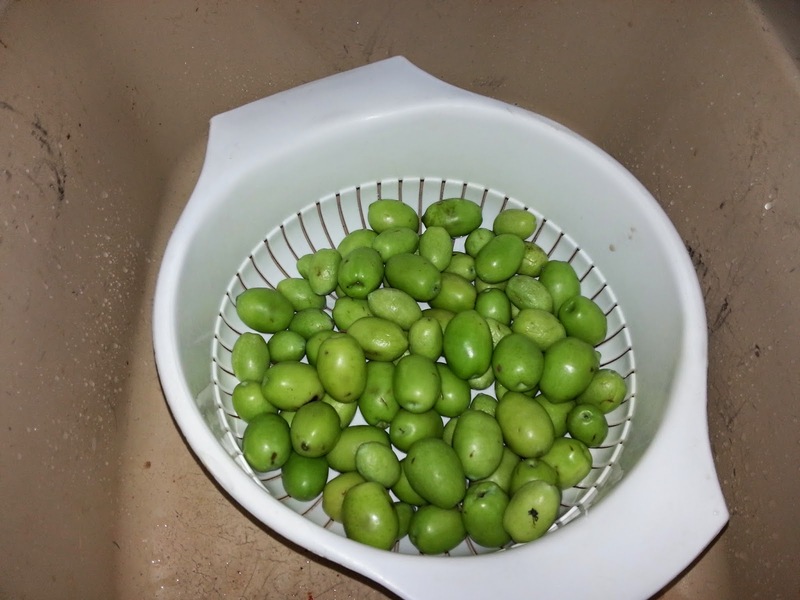 Once you have your green olives make sure you place them in a colander and wash them out. 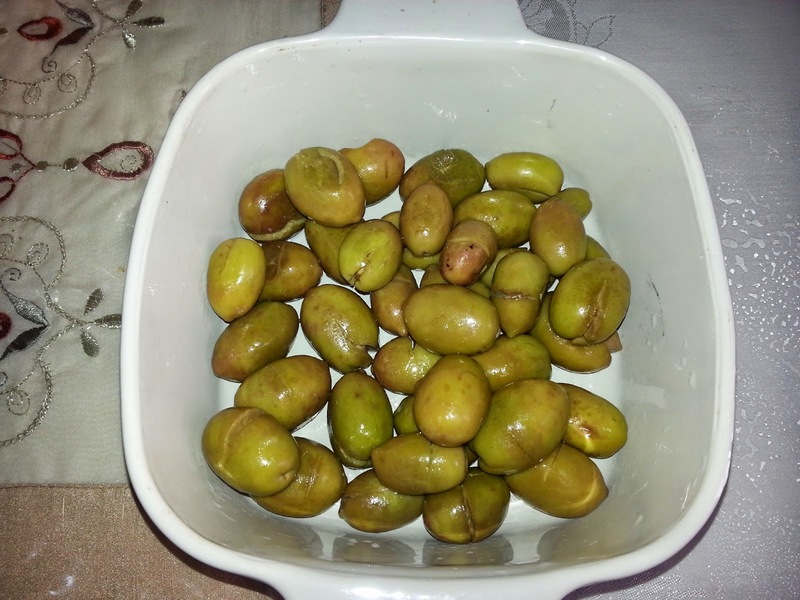 Take a large container, place your olives inside and cover with water, change the water every 24 hours so you can remove the bittereness from the olives, this should be done 4 times. On the last day of water changing measure your water. Add the same amount of warm water in a large pot, for every 4 cups of water add 1/3 cup of salt. ( This will be your brine) TIP: To make sure your brine is ready take a raw egg and place it in your brine, mix your water, if the egg floats don't add anymore salt if it doesn't, add more salt. 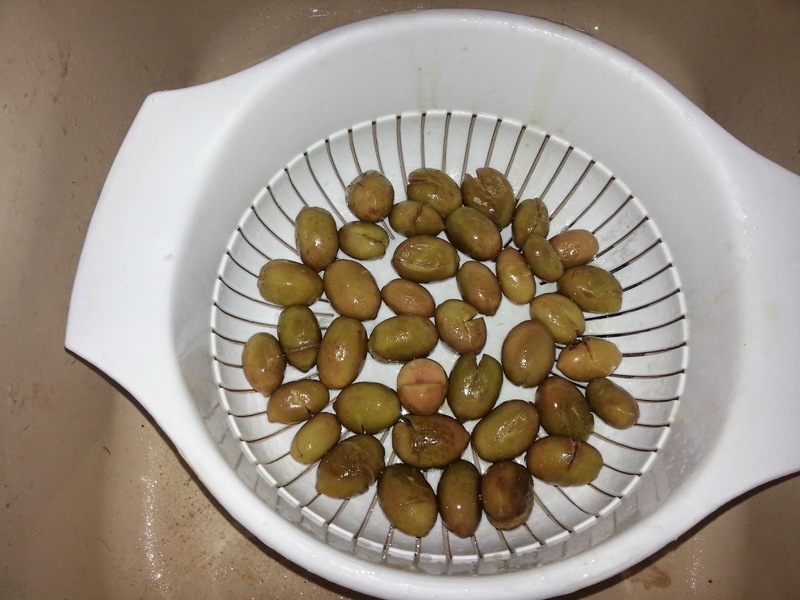 Let it cool down then place your olives in your brine. 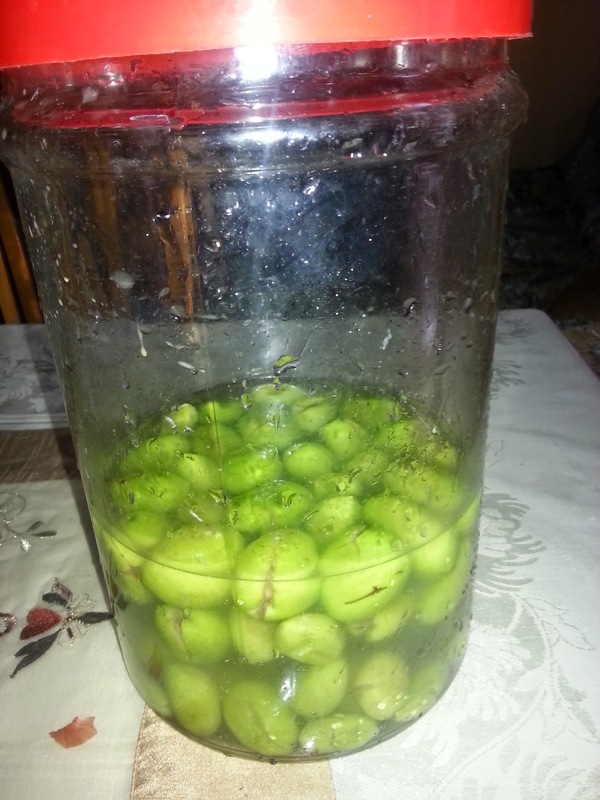 When your brine is ready, start to crack your olives. 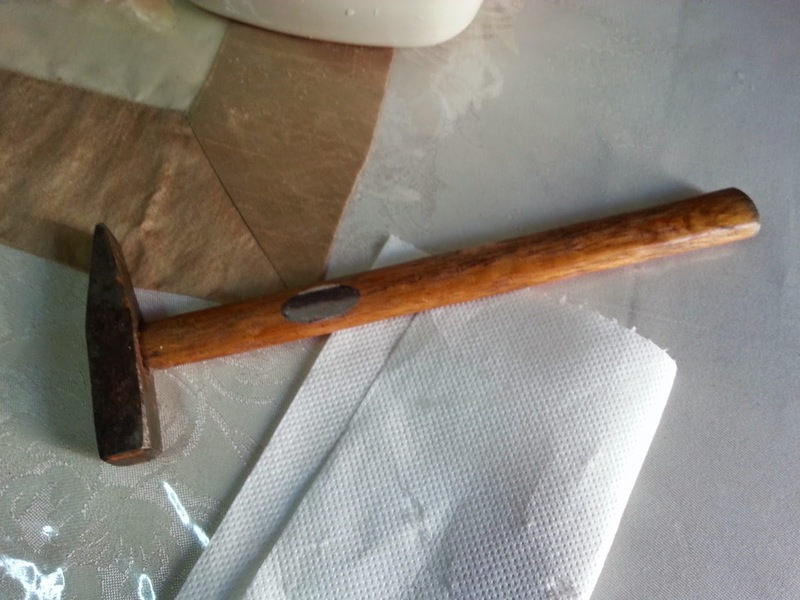 If you don't have a smooth stone, use a tiny handy hammer like the one shown in the picture, it works fine. 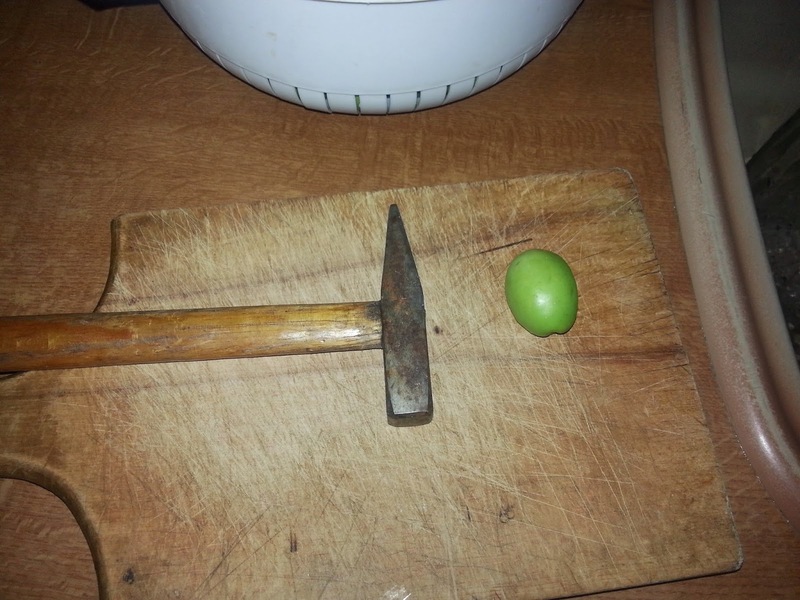 Take your hammer and hit your olive on the side just hard enough to crack. When all you r olives are cracked place them in your brine, add a small plate on top to keep all of your olive submerged.Add your vine leaves and on top your lemon slices and finally pour olive oil until the circle is covered, the olive oil seals everything together and doesn't allow any air to penetrate through to the olives. 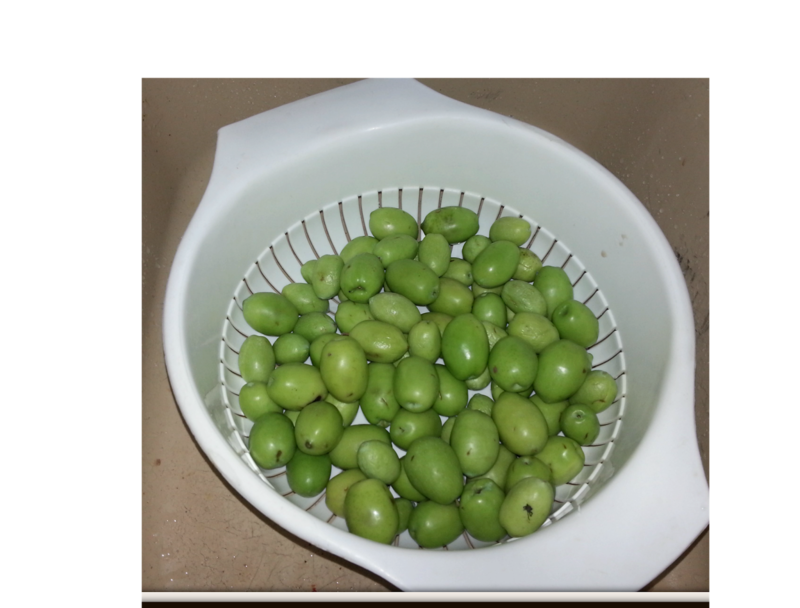 After 4 weeks your olives should be ready, take them out diseregard any dark ones or soft ones, make sure they are firm, rinse in a colander. 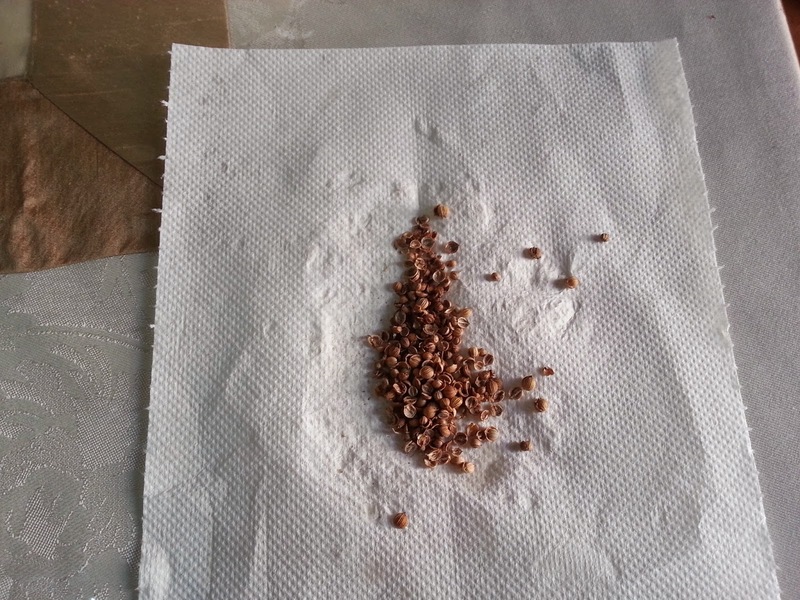 Take your coriander seeds place in a towel or paper towel, fold it in half, use your hammer to crush them. 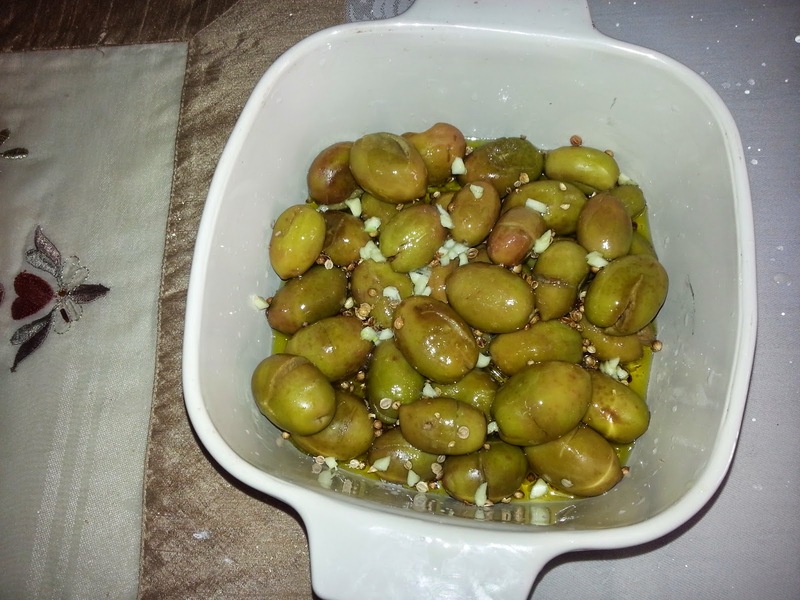 Add coriander seeds to olives, chop garlic, add lemon juice, olive oil about 8 - 10 tablespoons, mix well, cover and place in refrigerator for about 1/2 hour. 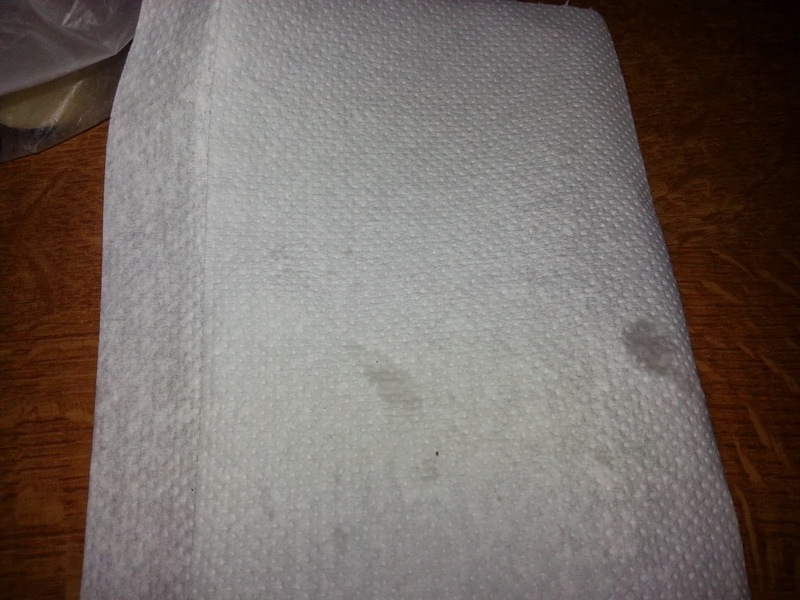 They are ready to serve. KALE OREXI !! Excellent for a starter at a buffet or a dinner party ! 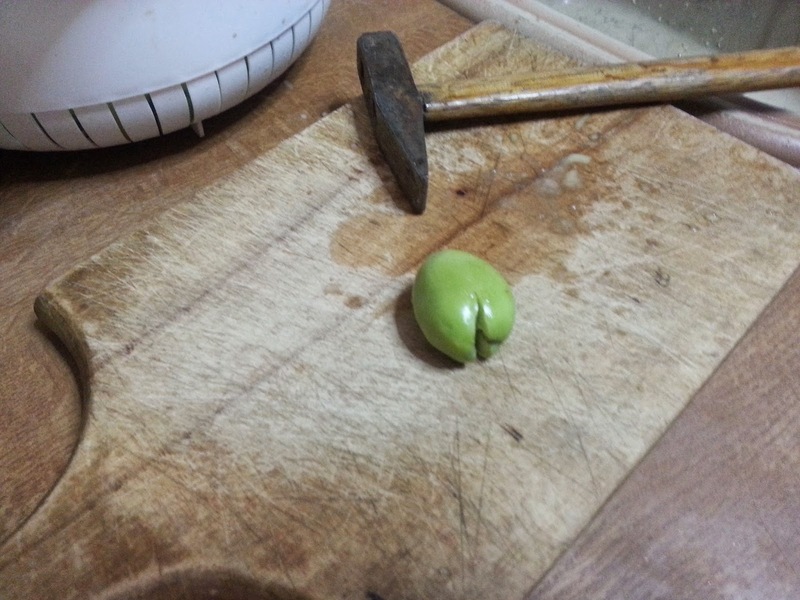 raw olives are hard to find here in my area, and my sad little tree still hasn't produced any (it is only 4 feet tall - ha ha). Someday I am going to do this again. so yummy! Where are you located ? You gave me an idea. I will place a link on top and then you will definitely find them. 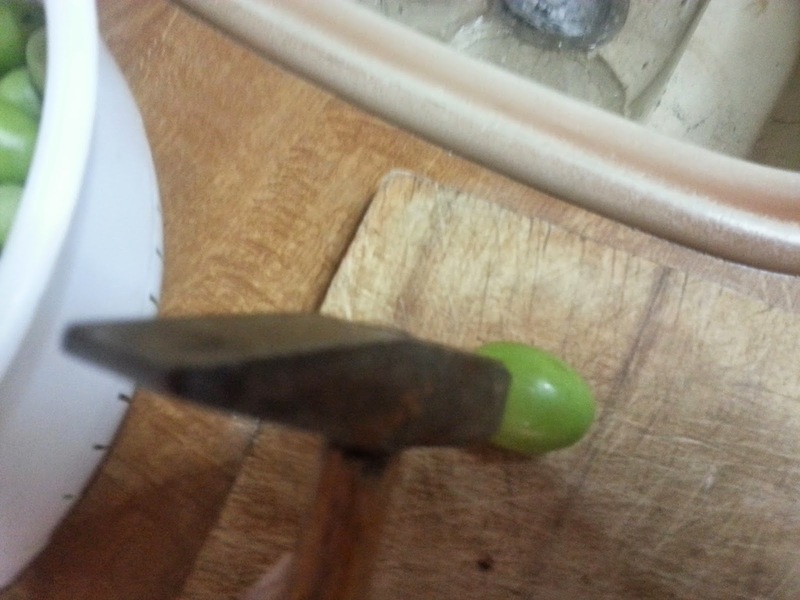 I have never thought of making my own olives. Thanks for sharing with Tasty Tuesdays! Thank you Jen, they are delish, once you try, you can't just stop at one.